Big Finish: Doctor Who - THE COLD EQUATIONS Review | Warped Factor - Words in the Key of Geek. Tony’s running out of air. The three Oliver Harper stories by Simon Guerrier introduced and delivered the Tardis lifetime of a brand new First Doctor companion on audio. Having established Oliver as a sixties London commodities trader who needs to escape from the police in The Perpetual Bond, second story The Cold Equations frequently has a claustrophobic feeling to it. That’s mostly down to the nature of some of the story, which has Steven Taylor and Oliver Harper, the First Doctor’s companions, drifting in a vacuum, protected from the obliterating frozen airlessness of space only by space suits, their air running out, every word of this mostly two-handed spoken-word play hastening their death by suffocation. There’s lots of increasingly intense breathing, and if you’re claustrophobic or asthmatic, go into this one preparing for the kind of ride that breaks the sweat out on your forehead. This is how this tense hour-long Companion Chronicle begins. Two companions, no Doctor, very little air left, and with Steven asking Oliver to tell him his secret, because there won’t be another chance. As with The Perpetual Bond, the set-up of this story never tries to do too much. For his first trip through time and space, Oliver gets a peak at the future, at a planet surrounded by a massive debris field – a junk yard of discarded technology thrown into orbit around the world – and a bunch of fiery-skinned aliens called the Callians who are here to salvage it, to sell the scrap for whatever it may be worth. There’s much more underneath the surface of The Cold Equations though than a kind of Steptoe And Son In Space. There are people living on the planet, and events are spun out of control when it turns out they’re humans, giving Oliver and Steven, under the labyrinthine meanderings of galactic law, prior claim to the band of space-junk. And then bits of it start colliding at incredibly dangerous speeds. The hows and the whys of Steven and Oliver ending up marooned in space form much of the action of the story, interspersed with those breathless sections of speech between the two of them, wearing out the air against the hope of defeating the cold equations of life and death. We think of The Cold Equations as the second Oliver Harper story, but really, for the most part this is a cracking Steven Taylor story. On screen in the sixties, Steven’s role was to be a younger Ian Chesterton – to fetch and carry and ask intelligent questions and hit the right people with something hard when the Doctor couldn’t or wouldn’t. In the world outside the storytelling, Purves’ role was also to keep an increasingly distracted William Hartnell focused and on-track so that recording could be completed within the punishing schedules of 1960s TV production. In the hands of Big Finish, it would be difficult to find a companion who’s undergone such a thoroughgoing deepening of their character as Purves’ Steven, and in stories from Mother Russia and The Suffering all the way through to The War To End All Wars (showing Steven years after the events of The Savages, a king deposed and discredited, with a difficult relationship with his family), the audio medium has sought at every turn to add some flesh onto Steven’s televisual bones. The Cold Equations pushes the envelope of Steven’s character development, reminding us very forcibly that he’s a space pilot, well versed in moving objects through both the vast tracts of empty space, and the debris fields than sometimes clutter them up. This is Steven in full space pilot mode, meaning the introduction of spatial geometry into the adventure. Guerrier had to promise his tutor to take a class in astronomy in order to get some of the explanations of rotating and moving bodies in space laid down in this story, and how, for instance, sometimes to go faster in space, it makes sense to slow down. The hard, factual, scientific rightness of all this means you could be forgiven at one point for thinking you’re listening to Purves read a transcript of an Open University programme from the seventies, imagining cones, cutting the tops of them and working out angles of planetary rotation and a host of other calculations for six separate ‘elements’ of various objects moving at speed simultaneously. And let’s be absolutely clear – you wouldn’t want Steven to be like this all the time. But once in a while, it really enriches our appreciation of the character to hear him be able to do all this in his head, when it really matters, when everyone’s lives are at stake. It’s a sequence that reminds you ‘no really, he is a space pilot, which is handy to have around.’ Steven also surprises everybody in this story by refusing to think small, refusing to focus on just saving himself and Oliver, but pitting his increasingly oxygen-starved wits against the cold equations of the universe and taking a shot at a bigger victory. Whether such audacity is simply a key part of his personality, or whether this largeness of scale is something of the First Doctor rubbing off on the space pilot, we’re less sure, but we like to think it’s a little of both. Oliver too, despite lacking Steven’s mathematical nous when it comes to drifting helplessly in space, has a vital role to play in this audio, and Tom Allen gives the young trader the bounce of a Labrador puppy, having escaped from the consequences of his actions in London. He’s a Donna Noble companion here, eager to experience everything there is out in the wider universe, to take his place alongside Steven and the Doctor as a citizen of the universe of time and space. It’s an infectious enthusiasm, tempered by the fact that we know from the beginning that their adventure above the world ringed in garbage and metallic junk leads him to be floating in space, at the mercy of Steven’s ‘cold equations’ – the realities that space inflicts. The unemotional stacking of the odds in a battle they mathematically, logically, can’t win. But there’s always room for a little Doctorish miracle within the framework of Doctor Who – if the universe were ruled entirely by the cold equations, it would be run…well, by the Time Lords, and the Doctor is the archetypal anti-Time Lord. He will always put himself between his friends and the cold equations of certain doom in the unfeeling universe, and here, powered by so many recent losses (this story’s inserted in a run of three in the immediate aftermath of The Daleks’ Master Plan, one of the most shockingly blood-soaked adventures in the Hartnell era), and empowered by Steven’s bravery, sacrifice and mastery of his own equations, the Doctor is able to pull a little something twinkly and mischievous out of the bag. That, after all, is what he does – with a little help from his friends. 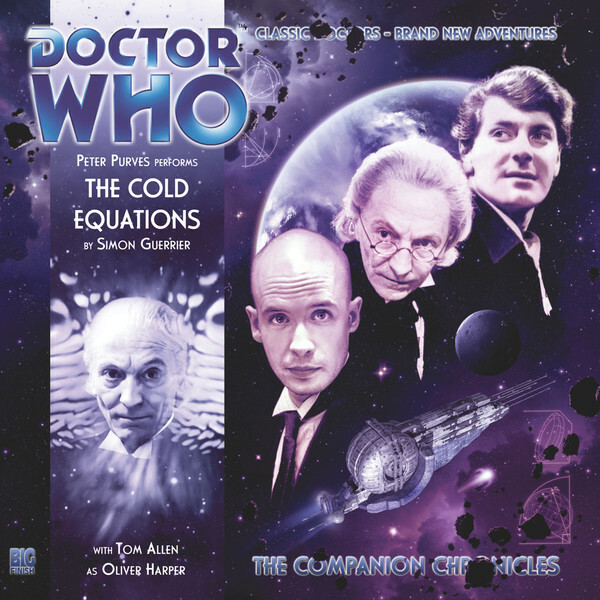 This story is richly textured, and you won’t believe how few voices are actually in it, Purves conjuring a very twinkly, happier version of the First Doctor in this environment than was called for in The Perpetual Bond. One thing that distinctly survives from that story though is the idea that these adventures could well have been a great addition to the on-screen show at the time. That’s a fanciful notion – the on-screen Who of the sixties would never have allowed Oliver, with his particular secret (which is revealed here) on a show aimed at families and children, and the geometry that gives this story both its learning and its sense of drama would have been considered too wordy for the show back in its early years, too complex and taking too much time out of an adventure. Be thankful then for the expansion of the First Doctor’s world at Big Finish, and for both a tightly written but simply stated adventure from Simon Guerrier, and top-notch performances from Peter Purves and Tom Allen to bring it to life in all its joie de vivre, its gasping tension, its bleak scientific rigour and its Doctorish wink at all that’s impossible in a sensible universe. Pick up The Cold Equations for a masterclass in companion-writing, and an object lesson in delivering an uncluttered story that still has plenty of suspense, world-building and personality.